5. Take a trip down memory lane and use the most popular mower of the 1960’s. 4. Every lawn deserves to look like a putting green. 3. Scissor blade action cuts every blade of grass. 2. Bermuda grass has met its match. 1. Golf courses across the world can’t be wrong. Pros: Reel mowers cut the grass instead of breaking off the grass blades, nothing will give a better appearance to a lawn, ideal for short cuts on dense lawns ( putting greens, Bermuda grass). Cons: Higher sharpening costs, will not cut very high grass or weeds, mulching is not an option. Features available: Front grass catcher, self propel. Reel mowers were made for those folks that take their lawns seriously - very seriously! Consider all the golf courses around use a power reel mower to trim the putting greens. Maybe you want your lawn to look as good as a putting green, too. This design tends to use smaller engines to get the job done. This is because turning a reel with blades attached takes much less energy that cutting and recutting grass clippings the way a rotary mower does. The grass is cut once, and thrown clear of the mower. This means lower fuel costs through the season, and fewer emissions polluting your neighborhood. These mowers are usually self propelled. The 2 large side wheels ( or the roller) is powered by the engine. To turn, the rear handle is pushed to the side as the mower moves forward. No steering mechanism is used ( other than pointing the mower in the direction you want to go). Although the power reel mower was once an American Standard, it has fallen in popularity. There are few manufactures left of these great machines left. 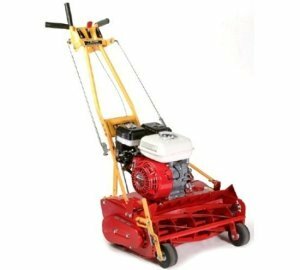 These Mowers are equipped with horizontal shaft four cycle engines. Most mowers vary from about 3 to 6 horsepower. The best mowers are equipped with engines that feature the overhead valve ( OHV) design, which provides more power, better fuel economy, and more efficient cooling. At the heart of any reel mower is the cutting blades on the reel. As a rule, the more blades on the reel, the more expensive the mower. The range for blade number is 4 to 10. Are more blades always better? Not necessarily. A higher number of cutting blades allows for more grass to be cut as the mower moves forward. The more cutting blades, the faster the mower can move, and still cut the grass properly. This is accomplished by moving the rear roller up or down. As the roller is moved lower, the bed knife is lifted farther off the lawn, cutting the grass higher. Most power reel mowers cut as low as one quarter inch, and as as 1 one quarter inches high. In many parts of the country, a low cut lawn thrives well. For those living in a dryer climate ( like the Rocky Mountain west) the Kentucky Bluegrass prefers to be at the upper range of length. In the old days, most reel mowers discharged the grass towards the reel. The modern premium power reel mowers are ‘Front Throw”, with the grass gracefully tossed to the front of the mower, instead of behind. This keeps the operator’s feet from being showered with grass clippings, and allows more efficient mowing. Now that the basics of Power Reel mower design have been covered, it is time to find the best reel mower for your needs and budget. The great thing about these machines is you would have a difficult time to find a brand that is not well built. It seems that all the machines reviewed are at least very good. Some, with more commercial features, are downright great. Take me back to Reel Type Lawn Mowers from Power Reel Mowers.